Huge Savings Item! 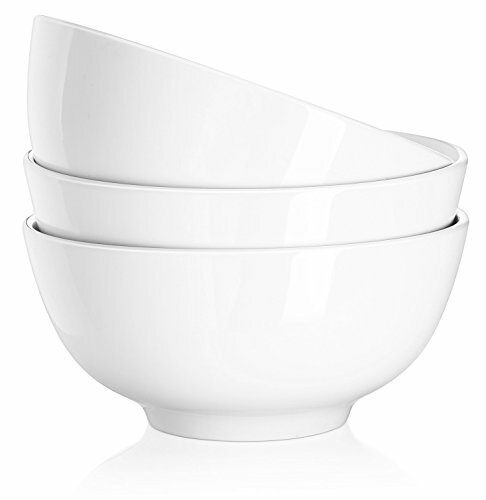 Save 15% on the DOWAN 29 Ounce Porcelain Soup Bowls - 3 Packs, Stackable Round, White by DOWAN at Amina Restaurant. MPN: SYNCHKG070902. Hurry! Limited time offer. Offer valid only while supplies last. SAFE AB-GRADE PORCELAIN - FDA approved, Cadmium and LEAD free, microwave, oven, refrigerator and dishwasher safe. The long-lasting material blocks moisture absorption and prevents cracking, crazing and rippling. Robust enough to withstand the rigors of daily life. A GREAT "ALL-ROUNDER" WITH A MULTITUDE OF USES - 29oz is ideal for porridge, soup, large desserts and puddings. Also great as something to cook a fruit crumble in to serve straight out of the oven. ETERNAL CLASSIC DESIGN - the timeless pure-white tone and classic round shape design make it a great all-purpose diner, restaurant style cereal bowl suited to any home's style and color and works equally well when mixed and matched with other items. KEEP YOUR KITCHEN CLUTTER FREE - this DOWAN bowl with firm bottom base is stackable for easy storage without toppling risk. They will take up less space in your cabinet. The nearly-nonstick glazed interior easily releases foods for quick cleanup. 30 DAY MONEY BACK GUARANTEE - We will offer a refund or replacement if you received a damaged or defective item. Please feel free to contact us. View More In Rice Bowls.